Afterschool.ae believes that we belong to our very own Community. Our Community is made up of diverse Parents, Kids, Educators from all over the world. Our Contributors and our Mummy Bloggers are too! We support our locally grown Mummy Bloggers representing so many cultures as they share their views, news, and give us a personal look into their lives. Thank you for sharing. I’m Helen Farmer, an editor and journalist, mum to 17-month-old Phoebe, wife to Nick and a mummy blogger in Dubai (even though I don’t really identify as one, but I blog, and I’m a mum, so there you go). I’ve been living in the Middle East for the last 10 years, working in books, magazines and radio, and now online, with this website shedding some light on the good and bad of life, work and motherhood in the UAE. I am Harkee, part-time lawyer, full time mummy to two little munchkins (Monkey, aged 3 and Missy S, aged 1) and wife to a wonderful man (Mr). Having moved to Dubai in 2007 from the City of London, I spent years caught up in the corporate world with little time for much else. Starting a family forced me to re-focus my energies and allowed me to get back in touch with my creative side. My kids inspire me every day to be creative, whether through art, music, play or food. I try to encourage their natural urge to explore the world around them and learn through play. We are lucky to live in an amazing city with so many different experiences and opportunities accessible to us and I hope to make the most of these to give my kids richly diverse childhood memories and also enrich my experience of motherhood. This blog is about our journey through the day-to-day; the experiences we have, the lessons we learn and the joy we share. It’s not always going to be plain sailing so there may also be some trials and tribulations involved (although for my own sake I hope not too many!) It’s about Monkey and Missy being kids, me and Mr being parents, us being a family and being part of a wonderful expat community here in Dubai. Through this blog I invite you to come along with us on our journey, AS they grow. I am a Civil Engineer by profession and a mother of a naughty little two and half year old boy! I quit my job to be a full time Mom and love to blog during my free time. 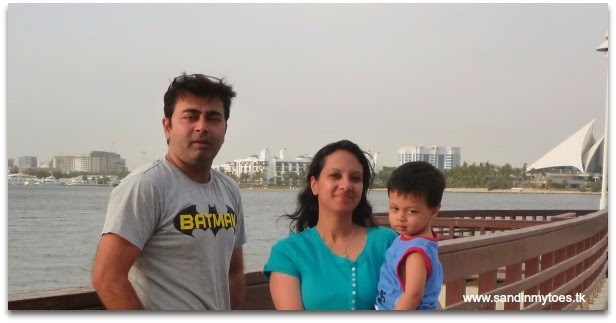 After I completed my Engineering from Kerala, I worked for sometime in Bahrain and India and later got married to Sandeep who is a Mechanical Engineer in Abu Dhabi. I moved to Abu Dhabi in 2011 after getting married and worked in Abu Dhabi for sometime after which we were both blessed with a little boy Sree Bharath (yes SB stands for Sree Bharath, I am not keeping it a secret like most mommy bloggers do, It’s really not that difficult to find it out anyway). Currently we are a happy family of 3 residing in Abu Dhabi. My Life as a blogger began in 2010, during the final year of my college, when I accidentally started a blog all about my musings and random ramblings. I blogged by the name Cindrella at Cindrella’s Expressions. When life took its serious turn, immersed in life’s changes, marriage, career and finally being a working mom, I left my old blog somewhere in the old worn out closets. In October 2014, when I finally quit my career to enjoy every moment of motherhood, I decided on getting back to the blog world. So here is the start up of the Blog Monsoon Breeze. Initially I began this blog just for time pass. I blogged during my free time to keep me connected with the world around. Later on, this blog became an obsession for myself. I began to be more of an organised person just to fit in some time everyday for my blog. More on my blog story later…Stay tuned. My name is Tarana Khan (you can also call me TK!) and I am a lover of words and wielder of the pen. Writing is what drives me and really keeps me going. In all, I have seven years of work experience as a copywriter, reporter and content editor. I left the corporate world behind when my husband and I moved to Dubai in 2008. I was always blogging (on and off) but Sand In My Toes only materialized about a year after my son, the Little Dude, was born. Blogging became my entry into a world where I could share my parenting experiences – whether they were inspiring, funny, or just frustrating. Since then, I’ve started writing about many more subjects, but the core focus of this blog has always been about being a first-time parent. I’m a parent…Parenting is a journey in which you grow with every step. Since I became a mother over two years ago, I have been through a roller coaster of emotions, and that’s what you’ll find interspersed in this blog. I have shared my adventures, observations, thoughts and emotions. When I can, I share some advice that may be of use to other moms.